previous post: The Jobs Plan – and then? next post: Will we really pay higher interest rates? Will we really pay higher taxes? Several readers have asked me to demystify the processes involved in issuing Australian government debt. They also sought an explanation for the sort of scare-mongering that various commentators have been engaging in about the increasing budget deficit causing higher future tax and interest rates because the “mountains of debt” will have to be paid back somehow. Well anyone who is worrying about saddling your kids (and their kids) with mountains of debt and punishing levels of taxation should “just take a Bex, have a good lie down” … and stay calm. All of these claims are of-course mythical and are designed to perpetuate the neo-liberal view that governments should refrain from interfering in the private market. So its time to arm yourselves with the weapons (arguments) that you can use when your mates start up with this nonsense. Yes, its time to debrief! While the specifics of this discussion are confined to Australian institutional arrangements, the general principles apply to any sovereign nation. This will take several blogs because it is quite detailed. In this blog we will focus on the question: Will we really pay higher taxes?. Short answer: yes and no! Yesterday, the Federal Opposition leader continued his assault on … well it is unclear what his assault is actually about … he seems to spend his days speaking in platitudes – the sort that no doubt his neo-liberal advisers have told him will scare the bjesus out of everyone … with the presumed aim of lifting his current popularity ratings off the bottom. He is now rated so low that there really is only one way to go!. Anyway, I digress. The Opposition leader has consistently been running this line. He waxed lyrical recently in a doorstop interview. He began by rightly noting that any fiscal stimulus that is completely saved will not expand spending. Duh!! He claims that “now beyond any doubt that over 80 per cent of that money was saved and not spent. We’ve seen a very big increase in household income but a very modest increase in household expenditure and household consumption …” I would actually like to see the data he is basing this claim on. Surely some was saved but there is no data to render the 80 per cent claim “beyond any doubt”. … but the one thing we know, even though it produced a very small economic stimulus, it will produce a very big economic drag in years to come when it has to be paid back because every cent of that $10 billion will have to be paid back, as will every cent of the $42 billion the Government is undertaking right at the moment. 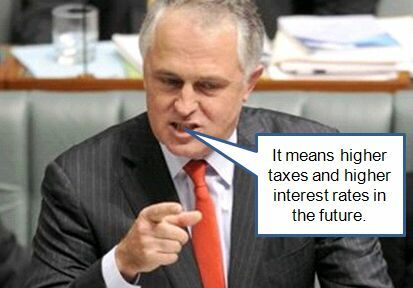 And that will mean higher interest rates for Australians in the future and, of course, higher taxes. This is representative of the nonsense that parades as informed economic comment out there which swamps the news and print media day after day. He is of-course just pushing the hollow rhetoric that neo-liberals use to exploit our confidence and comfort in a sovereign government that is actually using its fiscal capacity, in this case, to increase the budget deficit, to shore up aggregate demand and, hopefully, prevent damaging employment losses. While I have a disagreement over the composition of the fiscal expansion (I would prefer much more to be spent on direct job creation), the conservatives are attacking the notion of a deficit per se and want it limited (at some level that is undefinable) or else “all hell will break loose”. I have been urging journalists to ask the politicians to define the “ideal” budget deficit. In fact, trying to target a specific deficit size is pointless. The national government has to target a level of activity – preferably full employment – and then let the deficit be whatever it has to be to support the level of aggregate spending that will deliver that target. A budget deficit is what economists call an endogenous artificat of economic activity. In this specific context, it is the budget is determined as an ex post accounting outcome of the current level of economic activity. So when private spending is low, the deficit increases without the government doing anything because tax revenue falls (less sales, less employment etc) and welfare payments rise (more people on income support). Economists call these “non discretionary” movements in the budget balance automatic stabilisers because they work without any government discretion and help to put a floor in the plunging aggregate demand. Clearly, the reverse holds when the level of activity is higher. More people are working and incomes rise as does the tax revenue and less people receive income support payments. As a consequence, the budget deficit would decline without any discretionary government policy change. It means that the economy is getting stronger again. When I am speaking to business forums I make the point that if they do not like the current size of the budget deficit then they can easily do something about it. Start investing, start creating employment and before too long the deficit will be lower. So you can think of the deficit as being something that the private sector chooses by their spending (and saving) decisions. The more the private sector wants to save the income that is generated each period, the higher the deficit has to be to maintain that level of income (and related production). This is all a matter of national income accounting. Now think about these swings in economic fortune. A strong economy generates more tax revenue because employment and income are higher. A weak economy generates less tax revenue because employment and income are lower. We will come back to that in a moment. However, the budget deficit is also increasing at present (in all countries) because governments are acting responsibly and making discretionary decisions to increase their net spending (perhaps by tax cuts but more typically by increasing outlays). The aim is to stop the hemaoerraging in aggregate spending and to restore employment growth. The latter is driven by spending despite what the conservatives (and most of the employer associations) will tell you. Their claims that lower wages are the solution to higher employment growth fails to take into account that at the aggregate level lower wages reduce spending which causes unemployment. So in that case, if the strategy works, and it will eventually … it is just a matter of increasing the deficit until it does … then economic growth will resume and … without there being any further changes in tax structure (rates, exemptions, thresholds etc) … taxes will be higher!. Did I just say that? So am I actually agreeing with the scaremongers? Not at all. What they want you to believe is that the government will be so heavily indebted that they will have to increase tax rates to pay the debt back. As you will understand from my previous blogs, any sovereign government such as we have in Australia or, say, the US Government, or British Government, or Japanese Government, or the hundreds of other governments around the World, do not face a financial constraint. This means that: (a) the spending does not need to be financed; (b) that any debt instruments (bonds) that mature can be easily paid out by the government crediting relevant bank accounts for the coupon value (face value of the bond) plus interest owed; and (c) that neither of these actions have any necessary implications for future tax rates or interest rates. In fact, the tax revenue can rise at the same time as tax rates are falling – viz the previous Government’s booming tax revenue from the commodity boom accompanying their handouts to high income earners. In the next blog in this series I will talk specifically about interest rates because understanding how bonds are issued and priced is more complicated. But for now, it is clear that the Government may increase or decrease tax rates in the future as a policy decision. But an understanding of the sovereign government’s place in the modern monetary system will tell you that they do not have to increase tax rates to raise revenue to pay back spending they have made on our behalf sometime in the past. They may decide the economy is growing too quickly or that some segments of the workforce have too much disposable income (perhaps they want to reduce imports of luxury cars and so they would hike tax rates for high income earners). In these situations, they will make a decision at some particular time about the appropriate level of net government spending that is required to maintain high levels of employment. But these tax rises are not funding anything! They are draining purchasing power to stabilise aggregate spending at the desired level. So we should applaud the use of fiscal deficits at this time. They are helping us restore our private balance sheets (by “financing” saving) which were undermined by the previous obsessive pursuit of budget surpluses and also providing spending support for local production. Higher deficits look like they will be required but the Government is heading … sort of chaotically … in the right direction. Yes, tax revenue will rise with the increased economic activity but that is a different matter to saying the tax burden on anyone currently employed will rise. That is a separate matter altogether and the conservatives try to conflate the two to perpetuate their filthy side of the debate. Next time (not necessarily next blog) I will ask: Will we be paying higher interest rates because of the debt? Which will move us into a narrative about why is the Government issuing debt if it is not financially constrained! Today’s Australian had Turnbull qouted as saying something to the effect that the deficit was acceptable as long as it was used to finance the building of things like roads, bridges, dams, ports. No doubt just political opportunism, if he actually said it. Why would savings have been undermined by providing spending support for local production? I actually agree with him in that respect in the sense that the development of infrastructure will increase employment. I also think the stimulus should underpin the development of a local renewable energy industry which would provide some high-skilled manufacturing jobs. But I would do all that via the creation of public sector institutions rather than subsidising private profit … which I would not do. What do you think about the Reserve Bank’s decision to cut interest rates? Just starting a random discussion. Do you think it will make things in the Economy any better? I heard one report that most Economists agree with the cut but I didn’t hear where this information was from. I would prefer comments to be about the blog topic please? In relation to your question though, I do not think monetary policy helps much. There are winners (debtors) and losers (those who have investments and creditors). There is no coherent research which tells us what the net effect is. Not much I guess in the short-run. Best to use fiscal policy if you want spending to rise. So if the Government adjusts taxes and Government spending it will increase spending in this time? Do you think this would give people more confidence to spend their money. I hear so much stuff about recession etc in the media and sure we need to keep informed but I do no if it helps consumer confidence and surely that has a large part to play in public spending. Also, if you take the other side of the argument what effect do you think borrowing or bonds would have in this time? Yes, I too agree with what he (apparently) said, I’m just uncertain as to his sincerity. So what you are saying is that public sector job creation is a better use of government spending that subsising the private sector. I completely agree that it would be a better way to spend the money. Of course, governments have been committed to ever smaller goverment sectors for decades (but somehow, propping up the private sector was supposed to be acceptable). The net spending will be expansionary and should help the private sector develop some confidence that the bottom has been reached and that the government is committed to growth. I don’t think they have spent enough yet to get us to that stage. As to the borrowing … read my earlier blogs … it is a monetary policy strategy to manage the excess reserves in the banking system. I will write more about it another day. I think public sector job creation is much better than subsidising private profits. There is so much public purpose that can be fulfilled using the labour force that no-one else wants. There is so much unmet need out there that can be met using public works etc. I would provide a sound regulatory environment for the private sector to work within – consistent and stable rules of operation and then leave them to their own devices. No public money at all. I would then use the resources that it didn’t want -= at least 11 per cent of the available labour and rising – to generate socially productive outcomes. On the Broadband plan, I will write something about that when I have had time to really think about it. It is clear that the problems we face go back to the privatisation of Telstra in the first place and the creation of a competitive environment that was never competitive. So on first blush, creating a public controlled company to go door-to-door and avoid the Telstra (declining) infrastructure is appealing. But then I am reminded of the disasters that befell all the rail companies in the US when they all laid lines out to the West and all went broke because the fixed costs were too prohibitive for more than a few lines. But giving us capacity that matches the rest of the world is a great objective. So more later on that. Well, I was having a great run on the opinion blogs, arguing that federal budgets are not reserve constrained, taxes levied by the fed do not pay for govt spending until one blogger asked why if the fed is not reserve constrained and has no need to tax or borrow before it spends, why are they selling large amounts of bonds to the Chinese and why are they borrowing $500 million a week from them. I have not been able to verify these claims but if the government is truly conducting itself in a manner that so strongly suggests that it is reserve constrained and must borrow to pay for the deficit, then arguing the converse just became RATHER more difficult. The truth will now be dismissed out of hand and it will be very difficult to argue it. They are clearly borrowing billions of dollars. But that doesn’t then lead to the conclusion that they need to borrow to “finance” the spending. The Federal government clearly never needs to do that. There are many reasons why they are borrowing. First, they are voluntarily imposing rules on themselves along the lines I noted in the Will we really pay higher interest rates? blog where the Commonwealth has decided to raise as much as they net spend from issuing debt to the markets. They can do that as a voluntary matter but they do not have to do it. Presumably they are under the spell of neo-liberal economists who claim that there would be inflation if they didn’t. Again, a spurious claim but one that might bind them into these sort of decisions. Second, they are trying to manage reserves in the “cash system” so the RBA can maintain its target interest rate which is still non-zero. If they didn’t drain the excess reserves by issuing a interest-bearing asset (government bond) then competition in the interbank market by banks trying to rid themselves of under-performing excess reserves (remember the RBA pays them a return on the excess reserves in Australia which is below the current RBA short-term interest rate). That is a major reason for issuing the debt – to maintain the integrity of the current monetary policy stance. Third, you might like to consider that during surplus years they were still issuing debt. If debt was being used to finance deficits then why did the Commonwealth still issue debt when it was running successive surpluses for 10 years or more? Interesting question. In 2002, there was an outcry from the futures exchange and other traders when the government bond market started to dry up as the previous government was retiring debt (as it became due) and not issuing new debt. There was an Treasury Inquiry in December 2002 to consider this issue. I made a submission to this inquiry (with my co-author and friend Warren Mosler) which you can download from HERE. Basically, the bonds were being used by the private traders as riskless assets to guide them through uncertainty. So it was like corporate welfare all over again. They admitted that the bonds were not financing anything other than the “bottom lines” of their companies and making it easier for them to price risk. So there is no reason to be defensive. It is not RATHER more difficult at all to make the case that a sovereign government has no financial constraint. All you need to do is understand why the debt is being issued and to challenge the neo-liberal conflation that the issuance finances the net spending. It does not under any circumstances. Thanks once again Bill. I have not doubted that the constraint was voluntary, I just did not have sufficient information to argue that convincingly to those who are convinced that fed spending is reserve constrained. I now understand a little more than before. Steve Keen argues here that commercial banks, not governments lead the money creation cycle by creating debt first which the reserve is then obligated to finance and that money issued by government actually lags behind this process. I clearly do not agree. Ultimately, the government issues the currency which is then the basis of leveraging from the private sector. It is clearly true that commercial banks create loans at will to any credit worthy customers and then worry about getting the reserves later – either by borrowing from each other in the Interbank market or ultimately from the central bank. In fact, if the system is short of reserves then the interbank transactions cannot fix that. Central bank intervention either through open market operations (buying bonds back from the banks) or discount window loands is necessary. The central bank is not obligated to “finance” but rather will because otherwise it would provoke a bank failure. You can imagine cases where the reserve would allow a bank to become insolvent. But while this process creates bank deposits which can then be “spent” it creates no new net financial assets in the currency of issue. These are what I call horizontal transactions between non-government entities. They are characterised by the accounting statement that every asset that is created (say a bank deposit) there is an equal and opposite liability (loan) created (thinking about from the customer’s perspective – the opposite is the case for the bank)! So there is a shift in portfolio composition towards or away from closer liquidity but nothing net is created in the currency. The only way this process can occur though is if the government has spent in the first place. These are the vertical transactions I have written about which inject (or destroy) new net financial assets into the non-government sector. So Government spending creates financial assets in the non-government sector and taxes destroy financial assets. If the Government is running a deficit then it creating net financial assets and vice versa if it runs a surplus. The non-government sector cannot operate in the way I described above unless it has these assets initially to leverage the credit creation cycle off. You will also note Steve is quoting Keynes early on in the piece – well Keynes’ analysis is not applicable to a modern monetary system which has flexible exchange rates and fiat currency (freed from a gold standard). Keynes wrote about fixed exchange rate economies which are far removed in dynamics from what we are dealing with today in Australia. Further you will note he struggles with the question – why would the non-government sector demand the fiat currency if there was no government and no taxes (therefore no fiat currency)? This level of abstraction misses the crucial point that the currency is demanded because it is required to relinquish tax obligations. That generates a desire to supply resources to get the $s which then require the private sector to sell to the government (that is, accept government spending). That is the first thing that has to happen in a modern monetary economy. Then the private sector goes about its business. To deny all that is to misunderstand the role of government spending and taxation and its role in the non-government credit creation process. I still don’t quite fully understand Bill. Is it the case that ONLY federal spending can create fiat currency – the reserve cannot of itself create it? Keen is obviously arguing that new net financial assets can enter the economy completley independent of the federal budget and government spending, implying that deficit spending is unneccessary – if government elects to run surpluses, the reserve will simply issue whatever the private banking sector requires in order to lend. What is the origin of the money issued by our reserve if it cannot create fiat currency of it’s own accord? Of course even if Keen was correct, all the money issued in this instance could never replace government spending since it would be issued as private debt for cars, houses, plasma screens etc rather than being spent on education, health care, basic infrastructure – things that the profit-driven private sector cannot provide equitably to all. Today’s blog will help you I think. Your other blogger is wrong! re government borrowing. Am stilll having trouble convincing others that the fed does not actually need to borrow to pay for the deficit. Trouble is that the fed are giving every indication by their actions that they DO need to, and the alternative explantions underpinned by evidence such as still issuing bonds while running surpluses still do not actually prove that they don’t need to borrow in order to spend in excess of tax revenue. I would need to point to evidence of them running deficits for years without any bond issuance, or at least significantly lower than the deficit. Others argue that yes the fed can do that but the extra fiat issued will dilute the value of the currency. I haven’t yet asked them how the size of the economy has manged to expand over all these years without inducing hyperinflation. In any case, doesn’t net money leak out of the economy through fed taxation (which they argue is recycled and spent, not scrapped) and the trade deficit? I believe that we have not run a trade surplus for a long time because we export mostly rocks and crops while importing far more valuable consumer goods for which we have a have a huge appetite and have paid for heavily with consumer debt. Hmm. I now read that we have run a current account deficit for donkey’s years but have somehow offset this with a capital account surplus. But these are all private sector transactions and therefore all net to zero. We can’t possibly have gone on growing without government spending being expansionary at some stage (present era excluded – and we can see where the “let’s hok ourselves in private debt to the eyeballs while the fed runs surplus after surplus” approach has led). Lefty, if I may . . . I have a paper on http://www.cfeps.org that goes through much of this called “interest rates and fiscal sustainability,” though it’s quite long. 1. First, no economist anywhere disputes that the govt can spend as it wishes in the sense that it is the currency issuer (well, some do dispute, but they are at odds even with orthodox graduate monetary textbooks here). But note that govt ALWAYS creates reserves and deposits WHENEVER it spends, while it debits (destroys) deposits and reserves whenever it taxes or sells bonds (though in the latter case, the net effect is an asset swap of a bond for the deposit). 2. Second, by logic of accounting, when there are more net credits to reserves than debits (i.e., a deficit) the Treasury must sell a bond, or the Fed must, in order to drain reserves and hit the overnight target. Otherwise, there are undesired excess reserves (assuming there were none prior to deficit spending). Note that the Fed is contemplating issuing its own bonds once the current period of substantial financial market intervention is over (they assume that will be soon . . . probably wishful thinking). But clearly the Fed isn’t selling these bonds because it needs the money . . . the Fed even notes as much, that the bond sales are to drain reserves and help them hit an increased overnight rate target. Obviously, if the Fed doesn’t issue bonds to finance itself (which is obvious), then the govt that legislates the Fed into existence clearly doesn’t either, particularly since the operational effect of its bond sales are precisely the same as those of the Fed. 3. Third, the quantity of bonds that end up in private hands when a deficit is incurred is not set by the deficit, but rather by the central bank’s method of interest rate targeting. In Canada, there are 0 reserve requirements and the target rate is set above the rate paid on reserves . . . in this case there are 0 reserves held overnight by banks, and so any deficit incurred ends up as bonds held. In Japan during its zero interest rate period, the rate paid on reserves (0) equalled the interest rate target . . . thus, any deficit incurred could eventually be held by the private sector entirely as reserves; not coincidentally, the quantity of reserves in Japan rose to almost 20% of GDP. The US has traditionally been between these two extremes, with an interest rate target above the rate paid on reserves (traditionally 0) but reserve requirements imposed on banks . . . again not coincidentally, the relative quantity of reserves circulating in the US was greater than in CAnada but less than Japan, with the relative qty of bonds held in the private sector being the opposite. In the US now, with the interest rate target and rate paid on reserves equal at about 0.25%, much like Japan, increases in the national debt were held increasingly as reserves, which increased, in this case, to about 5% of GDP from less than 0.25% previously. The bottom line is that whether a given deficit is held by the private sector as reserves (i.e., “money” to people who wish to use that term) or bond sales is set by how the central bank carries out monetary policy. 4. Fourth, a deficit raises the private sector’s net saving and net financial assets, as the private sector keeps the bond or reserve as an asset, whereas the liability remains on the government’s balance sheet. Note, though, that whether or not the government sells a bond has NO effect on the ability of the private sector to spend or borrow to spend. First, loans create deposits, so the fact that a reserve has been drained and a deposit has been debited by a bond sale in no way constrains the financial system’s ability to create additional loans (that is, financial crowding out is inapplicable except under a gold standard or currency board). Second, nobody in the real world is ever constrained in their spending by the fact that they hold a Treasury security instead of a deposit, as the former is the most liquid security there is (to sell if a deposit is desired), the most valuable collateral possible for borrowing at the lowest possible rates (repo markets), and wealth (which enhances credit worthiness). Again, whether the government sells a bond or not when a deficit is incurred has no effect on the “stimulating” effect of a deficit (“monetization” vs. “financing” of deficits is meaningless except under a gold standard or currency board). The issues are the size of the deficit itself, which raises net saving by the same amount whether or not a bond is sold, and the effectiveness of the deficit itself in stimulating the economy (i.e., multiplier effects, such as tax cuts for the “rich” vs. tax cuts for people with higher propensities to spend, war spending vs. infrastructure spending, etc.). Thanks for that Scott, I appreciate that. By reserves, you are referring to reserves held by the central bank? As I have mentioned to Bill, I find your subject intruiging but, having no formal education beyond high school, much of the terminology used tends to leave me behind and as such, it is not rare for answers given to simply raise more questions. While I now understand that a federal budget is not reserve constrained, deficits do not equall debt and surpluses do not equall savings, and are steadily learning more, I probably need to read an introductory course in economics (economics for dummies?) to make all this easier to make sense of. The reserves referred to are the so-called clearing accounts that commercial banks have to keep with the central bank. In Australia they are called Exchange Settlement Accounts. They permit the payments (cheque) clearing system to operate. By the way, go to CofFEE’s WWW, where you will see an announcement of some public lectures that Randy Wray and I are offering next month. Two of these sessions will be Macroeconomics for Beginners. I know you live up in FNQ but we will be taping them and making them available by Podcast sometime in June. I will announce the availability here on the blog. Thanks Bill. I will be sure to watch that. They create a market for sovereign debt so the elite criminals who are too big to prosecute have a risk-free place to park their loot. :) Oh yeah, you can buy sovereign debt too, assuming you’ve got anything left over after your wages are confiscated via inflation (and if you believe shadowstats inflation is running around 16%). I realized a little too late that this was a 4 year old blog post. :) Oh well, my sentiment still stands.